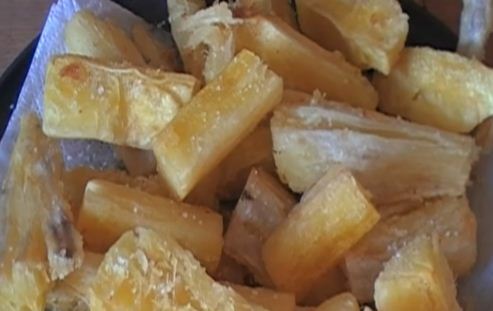 Cassava is popularly referred to as Mhogo (yuca) in Kenyan households. Meals made from cassava are dearly loved and enjoyed. Cooking oil, enough for frying. Add the sliced cassava into a large sufuria add little bit of water, turmeric powder/ food color and salt. Place on medium heat and cook until soft. Remove from heat and set aside to cool. Your fried cassava is now ready and can be served with Kachumbari. Enjoy!